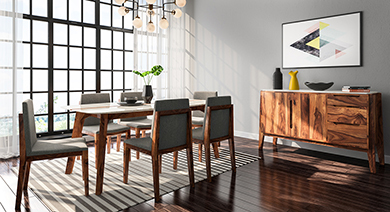 A stunning dining table set will seamlessly infuse an air of elegance to your dining room. To match your eclectic tastes, a breathtaking array of 6 seater dining table sets are present online. The modish designs and incredible comfort of these tables are bound to leave you enthralled! Explore a wide range of 6 seater dining table sets on Urban Ladder today! Find a large selection of 6 seater dining table sets by shopping online at Urbanladder.com. A dining room is one of the most important sections of a home. It is one that is most frequented by family and guests. Which is why it is important to maintain a strong architectural and design sense while planning the details of your dining room. 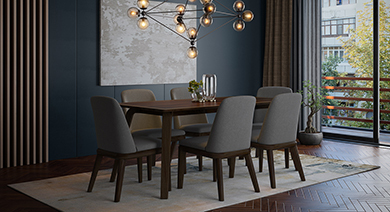 We, at Urban Ladder, offer you a large selection of 6 seater dining tables across a multitude of styles to ensure that you find the perfect one for your home. 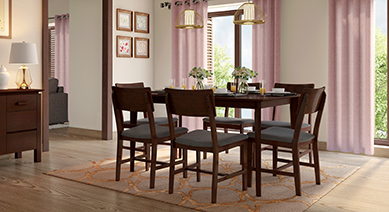 There are many options for you to select from while choosing the dining set for your home. 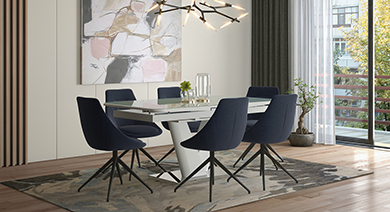 If you are looking for furniture that is crafted keeping in mind modern designs and innovative styling, then the Abbot-Grant 6 seater dining table range is an option that you must consider. The unconventional look of the product along with its superior build and colourful exteriors will perfectly balance and complement the subtlety of a modern home. The set is made from high quality rubber wood with the use of tempered glass panels for the desktop and upholstered cushions for the seat. Contemporary designs are some of the most sought after in the world of quality furnishing. We provide you with some striking options in the area including the Arabia and the Danton ranges. Both these 6 seater dinner sets have been made using high quality sheesham wood. But what sets them apart is their classy, grainy texture along with delicate styling that oozes class and elegance. We also offer a select range of traditionally styled 6 seater dinner sets, exemplified by the Brighton-Zella range. This particular range is simple in design but elegant in its execution with the use of classy colours to complement the high-quality sheesham wood used to craft the set. Shop online at Urbanladder.com and find the right selection of 6 seater dinner table sets for your home.